With “Net Neutrality” on the FCC’s horizon, and the ongoing teeth gnashing since Congress officially repealed privacy protections for consumers from ISPs, what’s been largely absent from the discussion is any recognition to the root cause of the issue – little to no competition. Privacy protection against ISPs is only necessary because the FCC only recently accepted a flawed base policy. That policy has allowed the duopoly situation in the broadband market to dictate terms. Without choice, consumers don’t have control, which makes things like the FCC’s now-dead ISP privacy protections seem appealing. In reality, they are only so within the flawed context of our existing framework. We’ve always advocated for an Open Internet – but now the very concept we’ve long hailed is in danger of losing its original meaning. The term is now being co-opted by D.C. politicians, used to describe a solution that varies greatly (and not in a good way) from the true Open Internet we’ve been advocating for all these years. The usage of this term in recent conversations by FCC chairman Pai to describe removing Net Neutrality is setting a dangerous stage. Not only is the term’s misuse a cause for confusion, but worse it will create the illusion that we’ve finally achieved the Open Internet people have been calling for, when in reality Pai’s solution is just the opposite. It’s essential to remember that the Open Internet as we know it refers to a situation in which network providers cannot restrict content or limit user access to services. 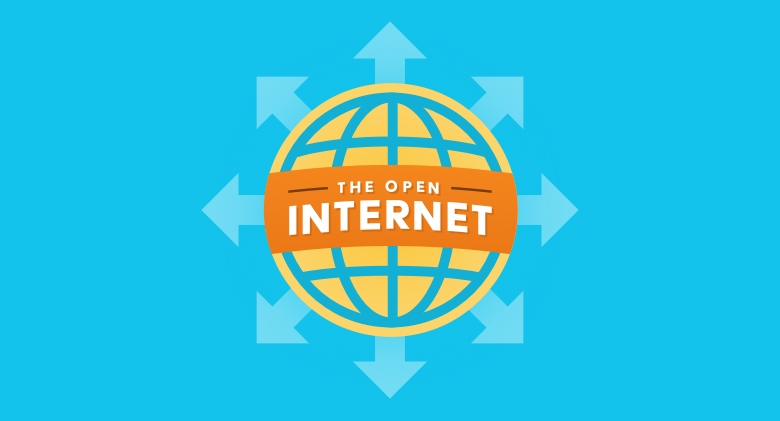 This Open Internet (in it’s accurate and original meaning) as a solution is not a “band-aid” as we’ve been so focused, but instead a return to a functioning policy and marketplace. The Open Internet is the only way to remove the over-regulated and unnecessary constraints that impede innovation, and only serve to protect the market share of big service providers from competition in the name of protectionism, and national security. What is likely unknown to many readers is that the term Net Neutrality is a concept created by service providers that prohibits ISPs from restricting content or limiting services available to users, and is often hailed as providing “equal access” to the Internet. This concept, however, is predicated on accepting regulations that decide how many – or in this case, how few – ISPs there are. In nearly every market, consumers want competition for their loyalty, and that includes broadband access. But Congress and the FCC are more interested in protecting the big service providers from competition so that they can maintain control over the information flow, often citing “security purposes” as their justification. For example, one of our own U.S. Senators explained his support for the anti-privacy resolution as part of the U.S. efforts to identify and capture terrorists. I am all for tracking and capturing terrorists, however I am against the unregulated capture of our information in the name of national security, and for the profit of those select few government-appointed companies that maintain control over the market. We need to stop speaking under a false reality, and hailing a principle that is so flawed. We do not have to exist in a world where the government chooses winners and losers to serve as our ISPs, yet this is the world Net Neutrality has enabled. It’s been this way for so long even bringing up the Open Internet is like bringing up a completely unfamiliar or untested concept. You often hear the excuse from policymakers that they don’t want to overstep their authority to regulate a company’s infrastructure. Communications used to be, and should, be handled like the competitive retail electricity service markets in many states that give consumers a choice, along with the economic benefits associated with that open marketplace. Texas, for example gives one company the exclusive contract to lay down and operate the local distribution infrastructure which transports electricity to consumers, but it is entirely wholesale in nature. That is to say, there is only one pipeline coming into your house for electricity. Retail providers pay the local company to use the distribution lines and get their energy to the consumer. If the infrastructure owner wants to provide retail service as well, it must create a separate retail entity and pay the same price as all others for use of the local network. Consumers in most Texas markets have hundreds of service provider options (just like they did for ISPs before the FCC changed its policy), and this was done with the express consent and support of the legislature, many of whom make up the current Texas congressional delegation. A healthy and diverse ISP market is critical to putting us back in control of our personal data, and to increase the innovation economy as a whole. So, while we too will likely take part in preserving the few privacy protections that remain with Net Neutrality, we will most certainly continue to fight for real progress, and the return of competition in the Open Internet.